The Shangri La Singapore, is a luxury 5-star hotel which has consistently been voted as one of the best hotels, not just in Singapore, but in the whole world! Set amidst fifteen acres, Shangri-La Singapore is known as Singapore's second Botanic Gardens and is perfect for tranquil exploration. The hotel also offers exceptional dining options at their award-winning Italian restaurant. Before we'd even entered the Shangri La Singapore, we felt their luxury and superiority to other hotels, because they sent a Mercedes to pick us up. This car was equipped with internet and an iPad for our use. 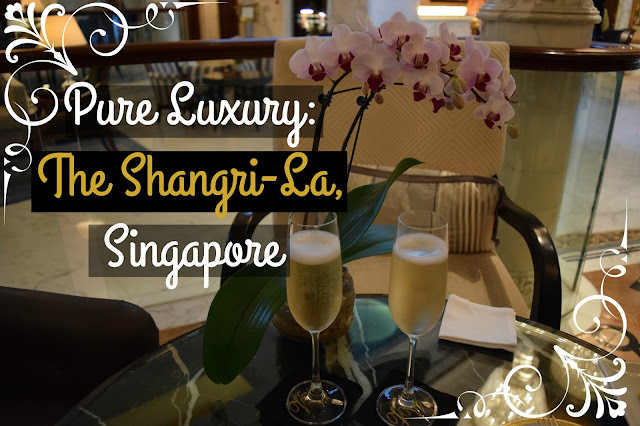 Our driver rang ahead to inform the Shangrila Singapore that we were on our way, so when we arrived at the Shangri La Singapore Valley Wing's private lobby, we were met immediately, given an orchid and taken straight up to our room. Check-in occurred in our room, which made it personal, efficient and private. Our room was perfect. The Shangri-La Singapore had contacted us in advance to ask our preference in pillows (contour, foam, bolster or buckwheat). Hence the bed was the comfiest we could have imagined. We also had a chandelier and another orchid. Our bathroom at the Shangri La Singapore Valley Wing was equipped with a gigantic shower (including a seat), a gigantic bathtub (with a tv at the end) and mood lighting! There was also a ginormous closet and safe. Our luggage was also there, I'm not sure how it got up there before us, but it was wonderful not to have to wait around for it. There were complimentary fruit and chocolates in our room, along with everything non-alcoholic in the mini-fridge (i.e. the juices, cokes, sprites, teas, coffees). The desk in our Shangri La Singapore Valley Wing was grand and we even had our own printer. We tried out the Shangri La Singapore Italian Restaurant: The Waterfall. This was by far the best meal we had in Asia, and actually one of the best meals we've ever had! Next up was the Waterfall's 'Stufato di Pesce' a.k.a their Signature Seafood Stew. This is a tomato based stew with lobster, prawns, clams, mussels and fish. It was the best we've ever tasted. After that was the Tagliata di Manzo Rucola e Grana - i.e. premium beef cuts marinated with peppers, served with rocket and parmesan. It was the most tender, the delicious beef I think we've ever had. We loved it! There was a lot of choices, but we decided on some cute little cheesecakes, of course, they were delicious too. We had lunch with the Director of Communications and the Assistant Communications Manager, who were completely lovely. Our tour started with the Shangri La Singapore Garden Wing, which was very lush and serene. The Shangri-La Singapore Garden Wing has a koi pond, complete with koi fish and three turtles! It truly was a tropical sanctuary. Each Shangri La Garden Wing room comes with a private balcony and a marble clad bathroom. Next on our tour was Shangri La Singapore Tower Wing, which, built in 1971, was the original section of the building. It has the most beautiful chandeliers, a grand sweeping staircase and massive columns of marble. On our tour, we noticed more and more orchids. 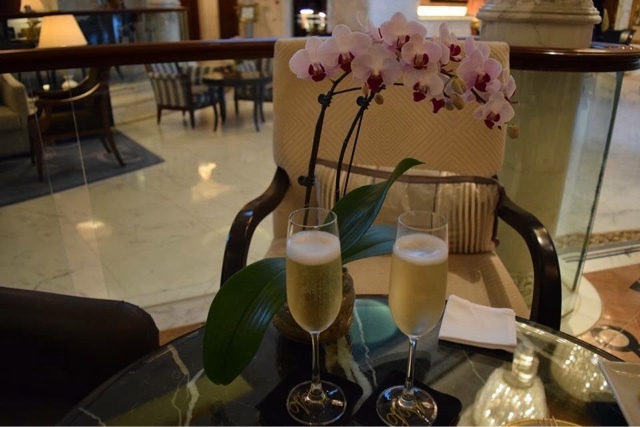 Shangrila Singapore celebrate orchids by dotting them all over the hotel. They have even bred unique orchids! The one we were presented on arrival is known as 'Dendrobium by Shangri La Singapore'. 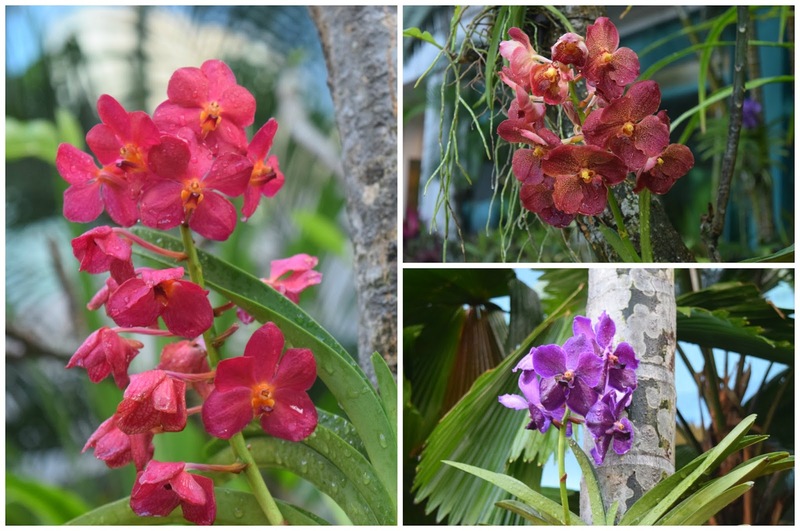 It's a long-lasting speciality orchid whose mother plant is Dendrobium by Paolo Sunshine and whose father plant is Dendrobium Pink Spider - a Singaporean hybrid. The Dendrobium by Shangri-La Singapore was named in commemoration of Shangrila Singapore's 35th anniversary. We were honoured to have been given something so special. After our tour, we tried out the swimming pool which has something that no other pool we've come across in Asia has: a deep end. Adjacent to it was a hot jacuzzi. We spent a good hour and a half here, it was wonderful. Shangri La Singapore Valley Wing High Tea is served daily between 2pm and 5pm. We decided to be a bit unconventional and go for a herbal tea, which was served from the most beautiful teapot. It was accompanied by a darling plate of sandwiches and cakes. It was the perfect afternoon snack. Served between 5pm and 7pm, the canapés were another delectable highlight. Each canapé was a little bite of heaven and the champagne that was served with them was divine. This was the highlight of our stay at the Shangri La Singapore, it was a real delight to sit in the grand lobby, sip champagne and listen to the incredible harp player - she played a mixture of classics and current chart toppers, including what I am pretty sure was Timber by Kesha. Shangri-La Singapore is situated in close proximity to the infamous Orchard Road. However, it rained an awful lot when we were at the Shangri La Singapore so we spent a whole 24 hours on site. We were secretly very pleased about this. All in all, this was the absolute highlight of our first month in South East Asia. Everything, from the food to the service, to the rooms was incredible and we had an unforgettable experience. We highly recommend that you visit Shangri La Singapore when you're in Singapore, it's absolutely perfect. This is where the legend of Shangri La Singapore was born, and we hope to visit many more of their wonderful hotels in the future. For more information, make sure to visit Shangri La Singapore's own website, in particular, their page on the Shangri La Singapore Valley Wing (where we stayed). Or find cheaper rates on Hotels.com or Agoda. And follow us on Instagram, Twitter and Facebook to keep up with our worldwide adventures! Disclaimer: Travelling Weasels were invited as guests of Shangri La Singapore, but as always all opinions are our own. Staying at the Shangri La Singapore is one of our favourite travel highlights and we hope you enjoy your stay there as much as we did.